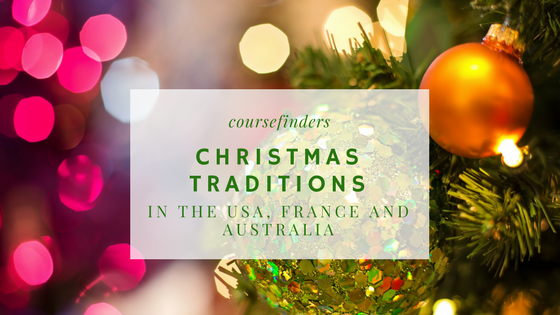 If you are learning a foreign language, you will be interested in the Christmas traditions of countries where this language is spoken. In this article we want to present the United States, France and Australia where the main languages are English and French. You could also attend a language school to get more information about Christmas traditions. Check the language schools here. Because of the country size the United States of America has a lot of different traditions, but the main ones are similar to the ones in the United Kingdom, The Netherlands or Mexico. The typical Christmas dish is turkey or ham with cranberry sauce. The buildings are decorated with a lot of lights and statues of Santa Claus, Snowmen and Reindeer. There is often a Christmas tree in the house which is sometimes decorated with popcorn threaded on string. Maybe the most famous Christmas tree is at the Rockerfeller Centre in New York. In addition a lot of Americans go to church to celebrate the birth of Jesus or to special Christmas Carol Events where the story of Christmas is told. Christmas in France is similar to Christmas in the United States. A special thing in France are the Yule Logs which are made out of cherry wood. The log is normally carried into the home on Christmas Eve and is sprinkled with red wine (for a nice smell when it is burning). In addition Santa Claus is called Père Noël. In eastern France he is also known as Le Pere Fouettard who is a man dressed in black and who might be the same person as Zwarte Piet in The Netherlands. On Christmas Eve the main meal is eaten which inclueds oysters, foie gras, lobster and cheese. For dessert, a chocolate cake (which looks like a log and is called “bûche de Noël”) is served. In Australia, Christmas is normally in summer. So it is very hot and a lot of people go camping. Furthermore they decorate their houses with Christmas trees and lights which could be a little competition between neighbours. The most families try to be home together for Christmas (to spend time with their relatives). You want to know more about the tradtions in these three countries? Then you could attend a language school to improve also your language skills.